Bicycling is part of the action. 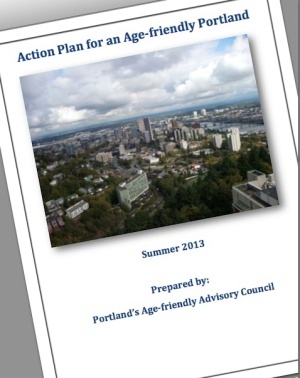 The ‘Age Friendly Portland Advisory Council’ (coordinated by the non-profit Elders in Action) has just launched a new website to spread awareness of the action plan they developed last year. In October 2013, Portland City Council adopted the Action Plan for an Age Friendly Portland (PDF) which outlines how Portland can help its older residents ease into their later years while enjoying active and socially vibrant lifestyles. 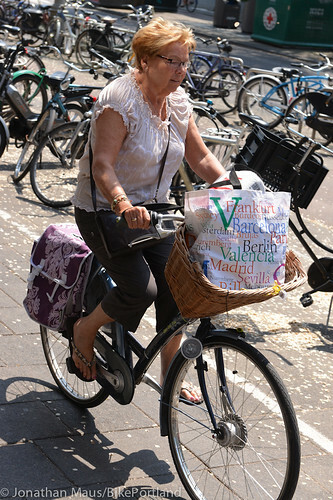 It’s not often talked about along with bicycling’s myriad other benefits, but cities where bicycling is easy and viable will enjoy a considerable head start in their efforts to be age friendly. We took a closer look at the action plan and were pleased to see that its authors seem to understand and embrace this concept. In the plan’s eight different action areas, several of them deal with issues that relate to bicycle access. 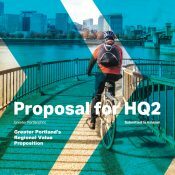 In the Transportation action area, the plan makes it clear that Portland must make it easy for seniors to use bicycles and other forms of non-car transportation. The plan even directly addresses active transportation. Action Item 2 – Active Transportation: Active transportation2 promotes active aging and is a fundamental aspect of an age-friendly city. Policies must be developed and implemented that result in environments are not automobile-centric, but rather, are developed in a manner that facilitates physical activity and convenient local access. Transportation infrastructure must be built to human scale, developed with universal design principles (above and beyond required minimum accessibility standards), and must ultimately lead to safe, healthy, efficient, and well-maintained systems. The active transportation/age friendly link should be obvious; but we see other parts of this plan where bicycling can play a role. In the “Respect and Social Inclusion” section, the plan’s authors write about the importance of reducing social isolation. “Finding ways to include aging Portlanders into activities and communities is critically important, as is stemming social isolation that has many deleterious effects.” One great thing about bicycling is that — similar to walking — it encourages much more social interaction than driving. Older citizens who get out into the neighborhood and run errands by bike will undoubtedly find themselves having more conversations with neighbors and friends. They’ll also feel more connected to, and invested in, their community. With so many young Americans afraid to bike themselves, it’s likely that many people think cycling by senior citizens is simply out of the question. But as we saw in a recent trip to the Netherlands and Copenhagen, when streets and services are designed specifically with cycling in mind, it becomes an easy, cheap, and extremely beneficial form of transportation. By 2030, the population of older adults in the United States is expected to double. And with Portland already being a magnet for climate refugees and other groups seeking the high quality of life this region provides, planning for an older population will become even more important. If our leaders are smart, they’ll heed the recommendations in this plan and make bicycling a key component of our age friendly future. 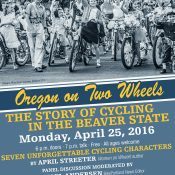 The more over-50 people we see riding around Portland, the better it will be. Sometimes, STG, I feel like a tourist attraction. People point and smile, and the word “quaint” hangs in a thought-bubble above their heads when I ride by. Especially in Waterfront Park. Gah! I’m just a gray-haired woman heading to work. I want that to be less “adorable”, you know? I want that to be less “adorable”, you know? It’s important that the elderly can ride bikes in a city, because then they will be less likely to run you down with their car. Watch it, whippersnapper! If you’re lucky, you’ll be old some day, too. Of the fatality accidents, hit and runs and DUIIs that occur so frequently, how many can you recall have been the fault of seniors? If you need to make damning, age based generalizations, you should look at young adults. I suspect, your cohort. Gray hair and just over 50 – am I helping? Does anyone think I’m adorable when I’m yelling at them? No, because they didn’t notice me in the first place. Maybe I need to take off the helmet and expose the gray hair. The 8-80 age-friendly approach is particularly>/i> appropriate for the NE Multnomah Street experiment, as it is solidly book-ended by two major retirement complexes, the Calaroga Terrace at the west end, and Holladay Park Plaza at the East end. Did you just say climate refugees? yep. it’s definitely a thing. Lots of people are starting to realize that even as climate change impacts begin and crazy weather happens all over the country, it’s still relatively pretty nice here all year ’round. Well if we’re getting climate refugees already then the end of the automobile is surely on the horizon. This, at least to me, is the most damning facet of these people’s obstinacy. They’re worried that an 18-month stint with no on street car parking in front of their businesses spells doom… what are they going to do when the cheap oil and the free atmosphere go away? 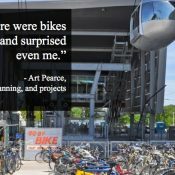 When walking and biking again become the norm? Who are they going to shoo over to 30th then? I was disappointed with the transportation portion of the report. It missed or glossed over improving the existing system safety. Ignoring or giving up on the existing system won’t help much. Me too! Thanks for giving me an excuse to share that story again for anyone who might have missed it or wants to read it again. With the brutal storms they’ve been having back east this winter, expect more climate refugees to show up in Portland over the next couple of years. I’m happy to soon become one of those refugees, like many other PDX lovers/residents. 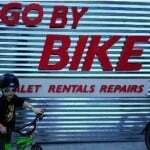 As someone who learned to ride a bike at the age of 64, I’m delighted to see this plan. I’ll have to say that knowing how to ride a bike has also made me feel less vulnerable to possible disruptions to our transportation system (from a major earthquake, windstorm or whatever). 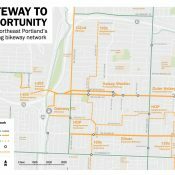 I’m looking forward to the day when they complete some “neighborhood greenways” in East Portland so I can actually use my bike for errands without having to ride in a skinny bike lane on an arterial street that has relatively high traffic volume traveling at relatively high speeds.